Everyone at Dal knows Munro Day; students, faculty and staff aren’t about to let a winter holiday pass by without notice, after all. But not everyone may know exactly why Dalhousie has a holiday named after a 19th century publisher. After all, George Munro lived most of his life in New York City, didn’t work for Dalhousie and never even took a class at the university. But in a time of great need, the publisher — who made his fortune in dime-store novels, handbooks and popular songbooks — helped save Dalhousie University from closure through his generosity, earning the nickname "The Great Benefactor of Dalhousie." Munro was always passionate about education (he taught at Free Church Academy in Halifax before moving to the States) but his Dalhousie connection came through his brother-in-law, John Forrest. A minister, Forrest sat on Dal’s Board of Governors in the late 1870s and approached Munro about Dal’s desperate financial straits. “Desperate is not too strong a word for Dalhousie’s financial condition,” writes Dal historian P. B. Waite in his book The Lives of Dalhousie. Working under a very different financial model than is the case today, the university had a government grant that was set to expire and investment income was struggling to keep the fledgling school running. “Talk of closing Dalhousie down was heard on every side," adds Waite. Munro was eager to help: his donation of $2,000 a year to fund a chair in physics in 1879 was the first of five chairs he would support, alongside thousands of dollars in bursaries. His total donations to Dalhousie ($330,000) would be upwards of $10 or $11 million today, adjusted for inflation. Observers at the time, like Board member George Monro Grant, credited Munro’s gifts with saving the university. Two years after Munro’s first gift, the Dalhousie Student Union asked the university for a winter holiday to honour Munro’s generosity, and Munro Day was born. And this in 2016, 145 years later, the holiday marks another first: it's the first to be celebrated on Dal’s Agricultural Campus, with faculty, staff and students there also receiving the day off. 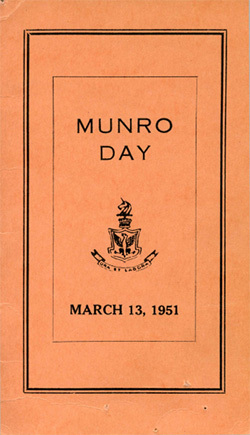 In recent decades, Munro Day has been celebrated on the first Friday in February. But that hasn’t always been the case. It was originally in January, and even moved to November in the 1890s. In the 1880s, the highlight of Munro Day was a nine-mile sleigh ride to a Bedford hotel for a fancy dinner. These days, the DSU organizes an annual ski trip to mark the occasion, keeping the outdoors-y spirit of the holiday alive. George Munro passed away in 1896 at the age of 70, but his legacy lives on today. Each year, more than 5,000 generous donors provide opportunities to financially challenged students, bring new academic opportunities to life helps Dal improve its campus and services. For more on the impact of philanthropy on Dalhousie and its students, read just a few of the many "Giving News" stories on the Alumni website.